Welcome to HebrewPod101.com’s “Ivrit be-shalosh dakot”. The fastest, easiest, and most fun way to learn Hebrew. Shalom, ani Yana. Naim meod. Hi, I'm Yana. It’s a pleasure to meet you. In this series, we’re going to learn basic Hebrew expressions. It’s super easy and it only takes three minutes! 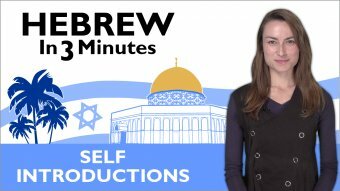 In this lesson, you’re going to learn how to introduce yourself in Hebrew. In Hebrew there is no formal and informal language. You can use this introduction in both cases and keep it simple. However, in Hebrew there is a difference between male and female language. Let’s first see how Israeli people introduce themselves in a simple way. Shalom, ani Yana. Naim meod. Hi, I’m Yana. It’s a pleasure. [slowly] Shalom, ani Yana. Naim meod. Start by saying: Shalom, ani... then, say your name. Shalom, ani Yana. Finally, say Naim meod. Shalom, ani Yana. Naim meod. Shalom, ani Yana. Naim meod lehakir otah. Hi, I am Yana. It’s a pleasure to meet you (female). [slowly] Shalom, ani Yana. Naim meod lehakir otah. Shalom, ani Yana. Naim meod lehakir otha. Hi, I am Yana. It’s a pleasure to meet you (male). [slowly] Shalom, ani Yana. Naim meod lehakir otha. So, what has changed from the previous introduction? Let’s take a close look at these together. The last part of the introduction has been changed based on the gender of the person you are talking to. Shalom, ani Yana. Naim meod lehakir otah for a woman, versus Shalom, ani Yana. Naim meod lehakir otha for a man. Ani- I am, in this case has not been changed, and in both cases stands for “I am”(regardless of your gender). The last sound of the last word changes, however. Otah, if you’re speaking to a woman, and otha, if you’re speaking to a man. One more time: The simple way to introduce yourself in Hebrew is Shalom, ani Yana. Naim meod. Shalom, ani Yana. Naim meod lehakir otah (female). Now it’s time for Yana’s Insights. When you introduce yourself, it's a good habit to shake hands in Israel. If you don’t want to worry about using the right word for men or women, just say Naim meod, as I said at the beginning of this lesson. There is no cultural importance if you add the last part to the introduction. It just makes the sentences more complete. Do you know how we say “thank you” in Hebrew? You’ll learn how to say this and many other words in the next lesson. Ad ha-paam ha-baa! Till next time! Let's introduce yourself in Hebrew! You're very welcome! 😄 Glad you've enjoyed the lesson! Thank you all for commenting and for the good feedback! Enjoy our lessons and please feel free to post your questions or comment, we will do our best to assist! Shalom Roi. Thank you very much for your answer. The lessons are very interesting. I'm Roi, and I'm here to help out with every question you might have about the lessons or Hebrew in general. We hope you enjoy our lessons! Please feel free to post your questions or comment, we will do our best to assist.